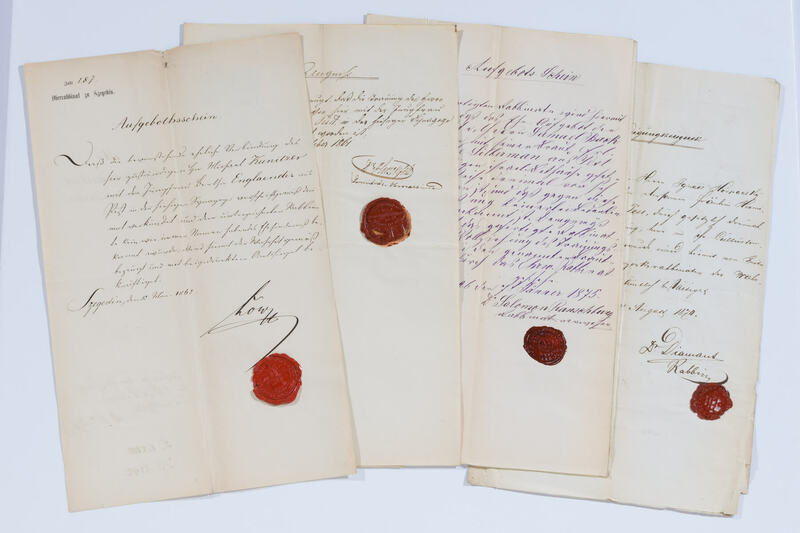 Consisting of 48 letters and documents related to the jewish community of budapest. There are identity documents,certified statements, letters of application, agreements, testimonies, contracts, declarations and rabbinical dispensations. Mostly in hungarian and german. Some of the important rabbinical leaders found include: dr. Mor diamond (losoncz trencsén), sabato raffaelo melli (triesti), solomon ranschburg (raab/gyor), hirsch bar fassel (kanizsa), lipot low (kanizsa/papa/szegedin), ignacz susz (ujvidek/neusatz), samuel spitzer (esseg), mark israelovitch pomeranz (odessa), lipot rosenberg (arad), armin schnitzer (komarom), wold meisel (budapest), isak elbogen (jungbunzlau), julius klein (budapest), meir kayserling (pest), samuel kohn (budapest), kohn armin (szigetvar), josef stier (szombathely), alexander kohut (pecs), albert stern-szerenyi(ujpest), klein manu (marczali), adolf schmiedel (prossnitz), weisz (esztergom), ignacz lichtenstein (gyogyos), m annheim (budapest), heinrich leo reich (weiselburg/bonyhad), lajos lichtschein( gran/csurgo), armin perl (kassau/kecskemet), pe osztreicher (altofen), josef weisee, (nove mesto), salamon bruer (papa), meir auszterlitz (eperjes), jacob heinrich hirschfeld (senica/papa), strasser leopold (kula), moritz lowy (temesvar), bernhard placzek (brunn), samuel partos (duna-foldar), raphael goldberg (budapest), jacob joachim ungar (iglau), klein mor (nagybeczkerek), stein hercz (szekesfehervar), heinrich pisko (malaczka), hirsch bar fassel (kanizka), moritz hirschfeld (temesvar) and sandor rosenberg (kaposvar/arad).